Saul tells how he stopped persecuting Christians and became a believer of Jesus. - Publisher This book tells the story of the conversion of Paul (Acts 9:1-22; 2122:1-21). The Arch Book series tells popular Bible stories through fun-to-read rhymes and bright illustrations. This well-loved series captures the attention of children, telling scripturally sound stories that are enjoyable and easy to remember. 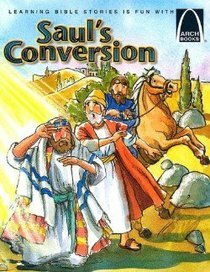 About "Saul's Conversion (Arch Books Series)"
This book tells the story of the conversion of Paul (Acts 9:1-22; 2122:1-21). The Arch Book series tells popular Bible stories through fun-to-read rhymes and bright illustrations. This well-loved series captures the attention of children, telling scripturally sound stories that are enjoyable and easy to remember.